There’s a funny way of looking at food when you first find out you can’t eat a certain one. I started dividing food into two categories: can and can’t. I can eat roasted potatoes, Alaskan salmon, fresh quince, raspberry jam, teff porridge, and duck confit. I can’t eat bread or pasta or pizza or pie made with wheat, rye, or barley, triticale, or spelt. But I can eat bread or pasta or pizza or pie I make myself, with a multitude of flours I didn’t even knew existed before I started living this way. Four and a half years after giving up gluten, the can’t list feels much shorter than the can list does. A little deprivation sometimes makes you see how full your life already is. 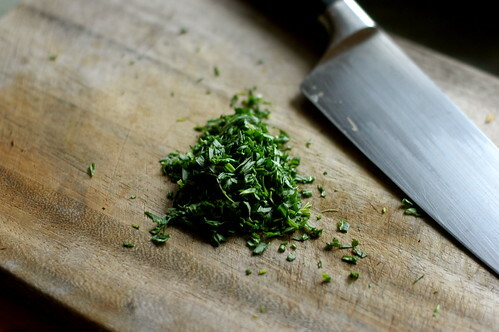 These days of grey, even a bit of green tarragon on a cutting board can revive the eyes. These chanterelles gleamed in the dim light of the kitchen window today, where I stood and watched Danny cook our lunch. We figured that this dish we conceived over the course of car trips and coffee cups and consultations with The Flavor Bible would come out well, based on our instincts. Still, we couldn’t put up a recipe without making it. Lunch was an empty slot, waiting to be filled. I couldn’t stop taking photographs of the chanterelles, bright as honey on a summer’s day, filled with frills and curlicues, fascinating to the lens. Everything is beautiful, if you really look at it. The shallots, fine-diced in a pile, sat translucent on the wooden cutting board. The dried sour cherries, puckered up as though waiting for a kiss, had been shoved to the back of the counter, so Little Bean couldn’t grab one more. The smell of cashews toasting in a pan kept me from moving to the computer, even though I had work to do. I picked up the toddler and showed it all to her. We watched her father cooking, head lowered, eyes focused on the work. Those moments were the best part of the day. Everything on that counter, all that bright and beautiful food, is something a vegan can eat. It’s too easy to put our traditions and expectations first, before our guests. What do you mean she can’t eat gluten? How am I supposed to feed her? I want, instead, to focus on the can. What can I feed you? I’d love to share this meal with you. Gluten-free? That’s never a problem here. Vegan? You bet. Look at these chanterelles gleaming. Have you eaten them with sour cherries? Oh, you’re in for a treat. Ali and Shirley served the MAIN COURSE on Wednesday, Nov. 18 at The Whole Life Nutrition Kitchen – Orange Pepper Salmon with Cranberry Sauce and gfe-glutenfreeeasily – Special Turkey Breast. Diane, Stephanie, and Ali and Shauna are serving the SIDE DISH/SALAD on Thursday, Nov. 19 at The W.H.O.L.E. Gang, A Year of Slow Cooking, and The Whole Life Nutrition Kitchen. This is so full of flavor that you won’t ever think of it as “vegan” or “special food” or “healthy.” It’s just good food, warm and filling on a cold November day. 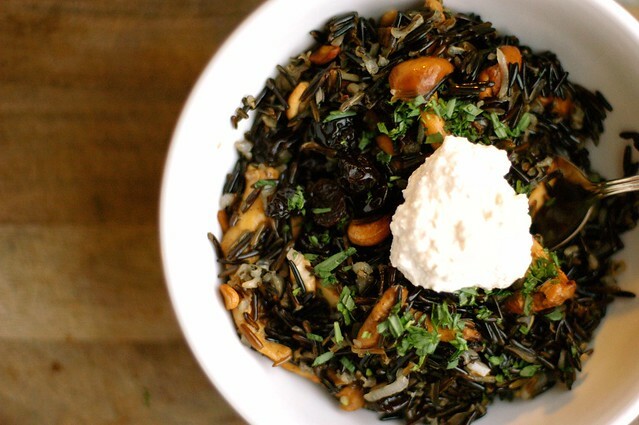 The wild rice clings to the chanterelles, which bounce back against the fork, and the sour cherries add a sweet bite. If you’re the kind of family that likes a wild rice stuffing for Thanksgiving? This could be yours. The cashew sour cream became an instant favorite here, after the first bite the other day. Someone mentioned cashew sour cream on Twitter, which reminded me that I had been meaning to make it since Heidi used it in a recipe, four years ago. Years ago, I might have thought that cashew sour cream sounded “weird” and stayed away from it. Lately, however, I have been thinking a lot about how all food is food to me. What does that mean? I don’t like categories. If it’s food, and I can eat it, I want to try it. Most of the time, I like it. If you make this, you’re going to want to try it again too. Cooking the wild rice. Put the wild rice into a large saucepan and cover with 6 cups hot water. Add the salt and stir. Set the pan over high heat and bring the water to a boil. Reduce the heat until the water stays at a medium-hard boil. Cook the rice, watching to make sure the water does not evaporate, until the rice is tender to the teeth, about 20 minutes. (You can also reduce the heat to low and simmer slowly, about 45 to 50 minutes.) Drain and set aside. Sauteing the salad. Set a large sauté pan over high heat. Let the pan grow really hot. Add the oil. When it swirls in the pan, toss in the chanterelles and cook, stirring, for a few moments. Add the shallots and cook them both, stirring. Toss in the tarragon and cook until it releases its fragrance, about 2 minutes. Add the cherries and toasted cashews. Cook for a moment, stirring. Add the wild rice and cook until it is heated. We didn’t need vinaigrette with this. However, if you find you want a bit more bite, we suggest a lemon vinaigrette with this salad. Cover the cashews with water and let them soak overnight. In the morning, drain the water from the softened cashews. Put them into a food processor, along with the salt and lemon juice. (We liked this lemony. If you want to mask the taste more, use less lemon juice.) Twirl it all up, pouring in the fresh water until the “cream” has reached your desired consistency. Refrigerate it for a few hours to let it thicken even more. Also, this cashew sour cream is great on tacos, enchiladas, and spread on warm bread. I have been looking for fresh chanterelles ever since you said you were posting this recipe. Can't find them anywhere! Would you consider using dry reconstituted, or a different mushroom. I am honing in on my vegan cooking skills, getting ready to host my best friend for dinner who is vegan. If you thought GF was a challenge and costly, I have news. My vegan grocery list lead me to three different stores and was very costly. In addition, many vegan stables and essentials have wheat. I'll take celiac any any day over that challenge. Anyway, thoughts about the mushrooms would be helpful as I would like to have this on Thanksgiving! Mmmmmm. I think I'll try it with a little finely-chopped kale…… Thank you!! Those chanterelles almost made me pass out. Beautiful. Can't wait to try the recipe! Yes, always focus on the can's … it just makes life so much easier. I so agree with you about looking at food as food vs putting it in categories. Sadly, sometimes when looking for gluten-free food (or whatever the category), much real food gets missed. Just a matter of changing one's perspective though, like you said. I love that philosophy — to focus on the can. When I cook for people who have certain dietary needs I always actually enjoy it — it often pushes me to try something new or to come up with a different way to do something familiar, which is both a challenge and lots of fun! And as a vegetarian who cooks mostly veganly … this salad looks amazing. Can't wait to try it. This looks so very delicious! I haven't tried chanterelles and would absolutely love to. Adding this to my Christmas dinner list! Very nice, thanks. I've done a stuffing using GF bread, but I've been looking for a dish like this to take to my folks for Thanksgiving. I wanted something that was GF by nature, not by substitution. This salad will be great. Love that you tried cashew sour cream! I've always wondered whether it was all-round delicious or only-if-you're-vegan delicious. Gluten-Free-Girl-endorsed delicious works for me. I'll definitely give have a crack at it. "Everything is beautiful, if you really look at it." I couldn't agree more! I love your photographs of everything and anything. Oh lord yes, gluten-free is about -can-, not -cannot-. It took me so long to focus on the 'can', but I can safely say now that any of my friends with food allergies would let me cook for them -any- day. Wild rice! I just got some yesterday as a matter of fact; I mixed it into a spiced pilaf – this salad looks like something I can make when I go back home next week. Thank you for posting it! I don't have chanterelles, but I do have fresh shitake and enoki. I'll just play with the substitutions and report! What do you mean by "mask the taste" of the sour cream? The idea of it sounded lovely and that scared me. Sweetpea, Danny says that dried chanterelles, reconstituted with water, would work really well here. You are wonderfully kind (as always) to feed your vegan friend for Thanksgiving! Chris, kale would be great here. I just like this as a template, and then switch it around with all kinds of different vegetables and tastes. Domesticaffections, they almost made me pass out too, looking at them! Gfe, it has been an honor to participate in this dinner party with you. Nicole, I really think everything changes when you focus on the can and yes, first. Thats how Danny and I feel about cooking too. Valentina Vitols, I cant wait to hear about the Philly feast! 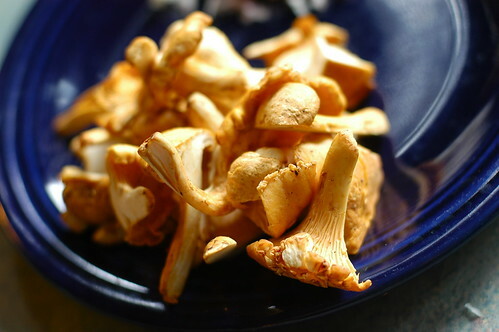 Fayinagirl, Youve never tried chanterelles? Stop reading. Drop everything. Go find some! Dave, thats usually my take too, to focus on the foods we can eat. This salad went away fast. Id love to hear how it works for you. Heather, I love how you put this. Cashew sour cream is all-round delicious. Absolutely! Ccr in MA, thank you. And taking photographs helps remind me of the beauty of it all. Shuku, Shitake and enoki sound delicious. In fact, want to come over and make that here? Cheryl, Im not sure what sentence you are referring to, actually. Nothing masks the taste of this cashew sour cream in this salad. I adore it! Thanks for this – I may make a non-vegan version this week to go with a pork roast. A good way to let the Chanterelles I scored at the market today shine. I was wondering about the masking comment you wrote to. I will paste it. I am fascinated to try the cashew cream as well as the salad. LOVE the cashew cream! My sister-in-law is vegan and I love the challenge of cooking for her. It really sparks my creativity. I've been looking for a 'creamy' topping for various recipes and this cashew cream fits the bill perfectly – thanks! Shauna, I'd be more than happy to come over and make it – now I've got to see if anyone's made progress inventing a teleporter… I will definitely report on how it tastes when I go home this Thursday. Yay! Incidentally, I made your brownies. They made me cry, they were so good, and they were -safe- to eat. Nothing better than knowing I can -eat- dessert again. Mask the taste of what? Just scored fresh Chanterelles to the tune of $30.00! This better be good! I was hoping to do a dry run but at that price I am going to hold out and wait until Thanksgiving. Why after your comment to Fayinagirl, "stop reading, drop everything and go find some" I just couldn't pass up the chance to try them as well. I too have never had a Chanterelle. Glad to know dried would work in a pinch but even happier I found the real deal! Happy cooking this week and I hope your Thanksgiving is wonderful! Laura, this would be great with pork roast! Christie, I like you way of thinking. Challenge, instead of annoying. Oh yes. bleu and Cheryl, thanks for pointing that out. I was tired when I searched for that phrase. I just meant you could use less lemon juice if you didn't want the taste so lemony. So, "…masking" the taste of the lemon. The acid is important here, but we liked ours to taste lemony. Shuku, I am so happy the brownies worked out for you. I love cashews! It's very exciting to see this post! Since i'm allergic to dairy I use as a substitute in everything. It's very versatile. Recently forgot coconut milk for a green curry sauce recipe. So I experimented with blending soaked raw cashews with young coconut water/meat for a green curry sauce. Other times i use it as a base for pudding. i HAVE to try this one out for tacos. yummo! Shauna, I've been reading your blog for almost a year, but never tried any recipe because, well, because I was too lazy and afraid to make the switch. Today is my second day on my detox program, and I'm doing a wheat free almost gluten free diet so far. In general terms I feel SO much better than when I eat wheat. (I supposedly have rosacea, but I guess is more gluten allergy, that's why I'm doing it). Well, the thing is for this Thanksgiving day, I want to give thanks to you for sharing all those lovely recipes and being such an inspiration in our lives.